Have you been hearing about the Swiss gold referendum and are wondering what it’s all about? On November 30, the people of Switzerland will be casting an important vote on whether the Swiss National Bank (SNB), the country’s central bank, should be required to increase and hold onto its gold bullion reserves. What’s behind this vote, and what might be its effects? Read below for the basics. How did the referendum come about? The Swiss gold referendum is a popular initiative, a means for Swiss citizens to propose changes to federal law. It was started by Luzi Stamm, an influential parliament member representing the Swiss People’s Party, along with two other parliament members. In order for a national vote on the issue to occur in Switzerland, a popular initiative must collect at least 100,000 signatures, which in this case were obtained by early 2013. The Swiss National Bank (SNB) would be required to hold 20% of the value of Swiss currency in circulation in the form of gold bullion reserves. The SNB would be prohibited from selling any of its gold reserves. All Swiss gold currently being held in the Federal Reserve Bank of New York would have to be returned to Switzerland. What might be the effects if it passes? According to the latest reports from the World Gold Council, Switzerland currently holds 1,040 tons of gold bullion in its reserves. This is equal to only 7.8% of the value of total Swiss currency in circulation – far short of the 20% the initiative would require if it passes. To meet the 20% minimum, Switzerland’s central bank would have to purchase an additional 1,600 tons of gold. GoldSeek notes that this amount is equivalent to about 60% of total global mine output in 2014, and that such a large purchase of gold by Switzerland could cause a “demand shock”. Since the central bank would also not be allowed to sell any of its gold reserves, supply would decrease as well. A steep increase in demand and a fall in supply usually leads to price increases, so a yes vote on the referendum could have a positive effect on gold prices. In the bigger picture, the Swiss gold referendum reflects a growing appetite worldwide for the yellow metal. A similar event occurred earlier this year when the German government battled over whether to continue storing a portion of its gold reserves in the United States. We are seeing more and more countries increasing their gold reserves and trying to store it on their own soil. Evidently, there is a growing preference among both individuals and central banks for storing wealth in the form of physical assets such as gold rather than paper currencies. 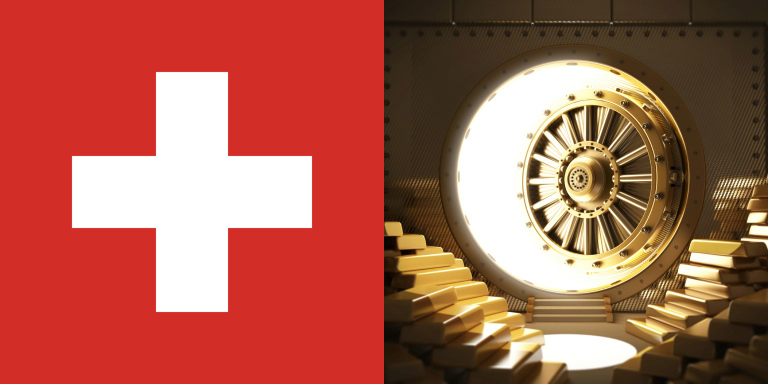 The Swiss love gold for asset protection…why shouldn’t you? If you agree with the over 100,000 Swiss citizens who believe their country should take steps to secure its wealth with gold, you may want to consider doing so yourself by adding physical gold to your retirement portfolio. Your existing IRA, former 401(k), or other qualified retirement plan can be converted to a self-directed Gold IRA holding physical gold coins or bars, often free of taxes and penalties. Gold has been historically shown to hold its value even through the worst financial crises, protecting your assets from the threats of inflation, market crashes, and geopolitical turmoil. Why not give yourself the peace of mind of having long-term financial insurance? Call American Bullion today at 1-800-326-9598 to get started.